Bear 45,000 aptly named Stirling Downs Stormy has joined his mates at the Western Queensland Drought Appeal to help raise funds to support our communities who are experiencing the on-going impacts of this extended drought. The Drought has been hitting the region hard for several years and it is not only the farmers who are hurting, many small businesses in the towns across the region are struggling too. People have been tightening their belts and many small retail businesses in western towns are struggling with a substantially reduced revenue. Businesses have become more innovative where they can, using digital tools to market and sell online, targeting and capturing the tourist dollar and cutting back on stock and staff to minimise their overheads. At Tambo Teddies we are still moving forward and aren’t directly hit by the Drought as we aren’t reliant on the local market and have a strong online income stream. We have a product that brings people into the town, encourages them to stop, stay a bit longer and support our local business community. While we aren’t personally hurting we are acutely aware of the impacts of drought on our community, our farmers, local businesses and the wider Outback region. Last year we dressed some bears in Drought Appeal T-shirts and Bear-as-a-Bones for the Western Queensland Drought Appeal Committee to present to their major donors. The Committee recently placed another order and it coincided with the advent of Bear 45,000. We had put a call out for suggestions of a really worthwhile cause who could use this bear to raise funds for their organisation. We received many suggestions but overwhelmingly the Drought Appeal was the most popular, with well over half the ideas relating to raising monies for droughted communities. The WQDA Committee recognise the importance of supporting not only the farmers during the drought but the small businesses and the communities as well. 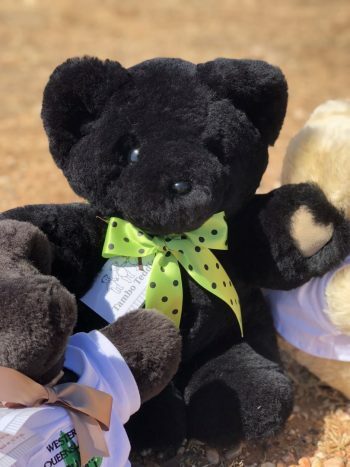 They have also supported us by presenting major donors with a little piece of the Outback in the form of a Tambo Teddy so we thought they were the best organisation to give bear 45,000. So the decision was made and we packed up Stirling Downs Stormy with his drought bear mates and sent them off to Longreach! After four years running this business I still love wool! Teddies is always taking us on another adventure as we strive to improve and grow this little business. I love meeting the challenges that pop up and enjoy marketing our Tambo Teddies to the world.